A few weeks ago, the Tuesdays with Dorie bakers made Golden Brioche Loaves. Well, that brioche recipe makes a lot of dough, so in addition to a loaf, I made Brioche Raisin Snails, and now I bring you my final installment: Pecan-Honey Sticky Buns. Another brioche success! These were decadent and delicious. I timed my baking so that I could give away most of them – spread out the calories, as I like to say. By the way, Michele also baked some brioche and is posting it today. I don’t know the details, so I’ll be checking out how hers turned out and what recipe she used. What I did: When I made the brioche dough, I took half of it and prepped it for the sticky bun recipe by rolling it out, spreading it with cinnamon filling, and rolling it up. Tightly wrapped, it stayed in my freezer for a few weeks. The day before baking, I put the dough in the refrigerator. The day of baking, I made the topping (butter, honey, pecans, and brown sugar), sliced the log of dough into rounds, and let it rise before baking. How it went: With the dough already made, this went quickly. Also, since the dough had been frozen, it was super-cold and easy to slice, which made my life easier. The buns are baked on top of the topping, so they need quick flip as soon as they come out of the oven. I’m happy to report that I didn’t burn myself or get any topping on the floor! How it tasted: My husband and I each ate one warm from the oven and loved them. My husband liked how they were sticky on the outside but not soggy. Our neighbor reported that he put them in a bowl, chopped them up, and topped them with half-and-half. As long as he enjoys them, he can do what he wants. He gets points for creativity, and for making these even more rich. Open your copy of Baking: From My Home to Yours to page 51 and get sticky! Or, you can find the recipe here. I would love to have one of these buns for my breakfast tomorrow! Ahhh, we need the technology so that I can zap one out of the screen. 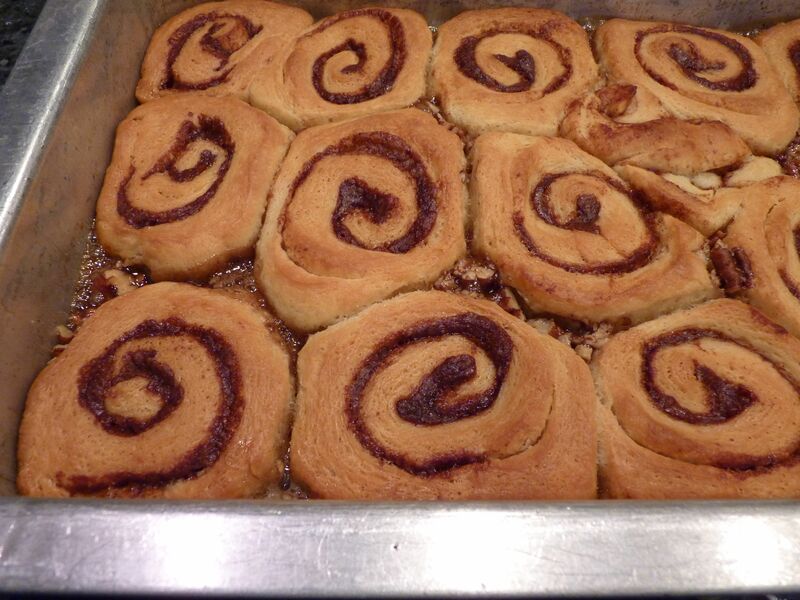 These buns look absolutely wonderful. I don’t think I could trust myself with them, even if I split them in three! These would be a total danger for me, which is why when I made the brioche, I didn’t make them. I would LOVE them and the boys would not because of the nuts. That last thing you said about your neighbor reminds me one of my friends (her whole family) would pour a glass of milk over a piece of birthday cake. I never could stomach the idea of soggy frosting and cake. They said they’ve always done it that way. 😦 To each his own. I remember that trying to flip these sticky buns out of the pan was so terrifying but it looks like you handled it like a pro 🙂 I haven’t made these in years, I’m long overdue for another batch. Your neighbor chopped them up and soaked them? Yikes. We love these so much, I make them on holiday mornings now since the first time I made them for the group as they were such a hit. Yours look stunningly gorgeous! 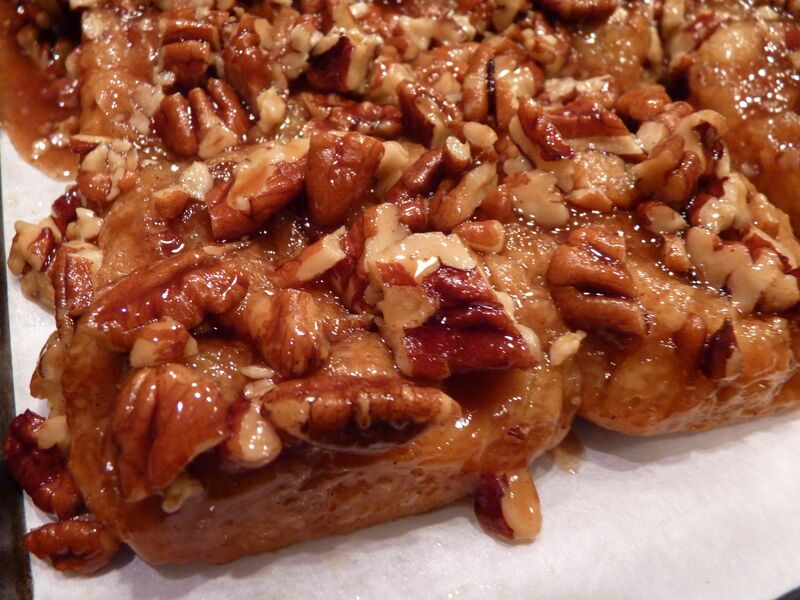 Your sticky buns are perfect! I’ve always stayed away from making these because of the stickiness factor, but yours look delicious. This looks amazing! My husband would love something like this. But I do not have the patience for this. Great picture!! They look awesome! And sound so easy when you have the dough already in the freezer. Love that your neighbor put half and half on top- too funny! Good Gravy!!!!! That looks SOOOOO stinkin’ delicious! Nicely done, my friend!!!! !